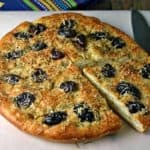 Greek Olive Focaccia Bread is a simple recipe that can be prepared with your favorite pizza dough recipe or by using a store bought pizza dough. 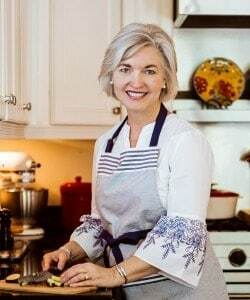 Use pre-made pizza dough for an easy shortcut in this perfect homemade focaccia bread recipe that I first shared over at The Weary Chef. 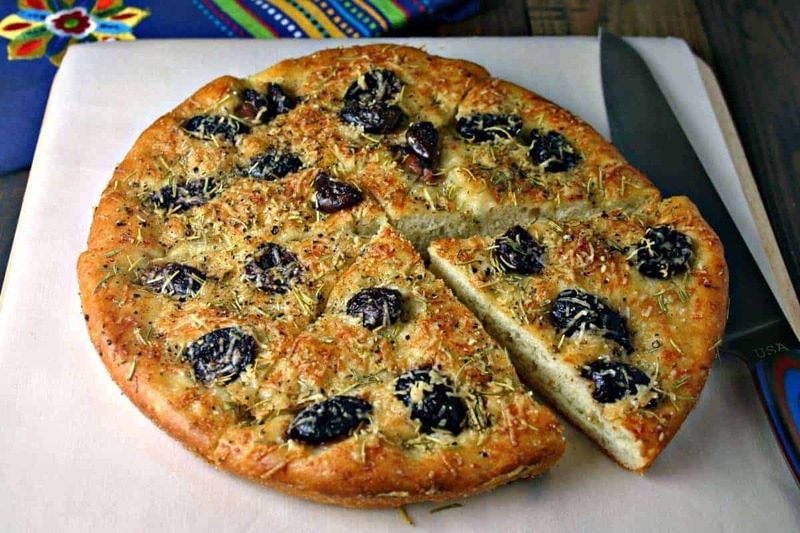 Greek Olive Focaccia Bread is a simple recipe that can be prepared with your favorite pizza dough recipe or by taking a shortcut and using a store bought pizza dough. True confession — if BREAD was classified as a food group, it would be my favorite. Yes, technically bread falls into the “grain” food group, but let’s face it, grain is pretty much nothing until it becomes BREAD, right?! 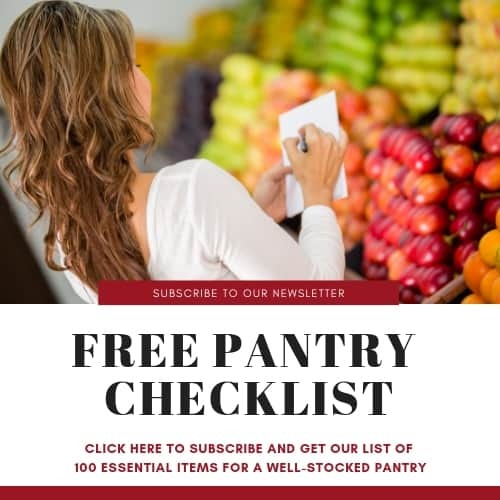 Until the last couple of years, I would only venture into baking quick breads like biscuits or cornbread (that’s a testament to my country roots). Now, I’m a little less intimidated by the idea of baking with yeast, but that takes time and I don’t always have the luxury of the extra time needed to bake bread totally from scratch. 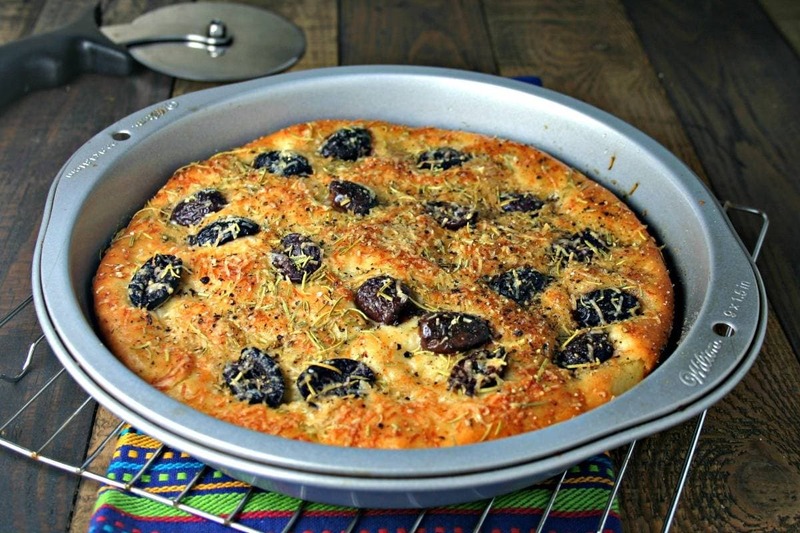 I’ve recently discovered that the deli at our local grocery stocks fresh pizza dough, so when I’m short on time it’s a great alternative for homemade pizza night at home or for baking this delicious Greek Olive Focaccia Bread. 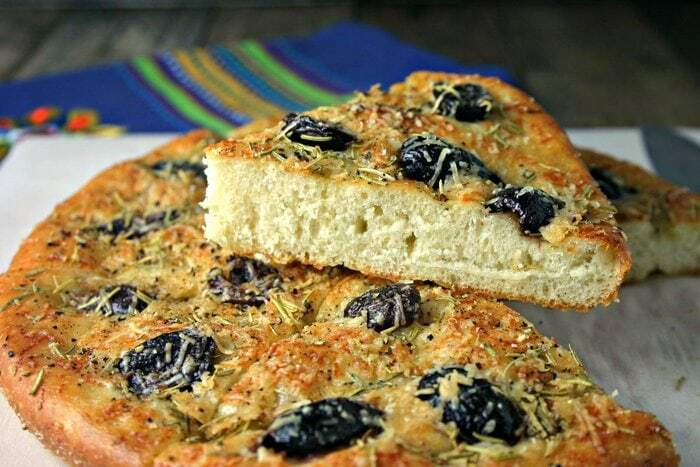 I like to bake my focaccia in a round pan, but you can also make this recipe in a square or oblong pan, if you prefer. Start by adding a couple of tablespoons of olive oil to the bottom of the pan and spread it around with a pastry brush. On top of that evenly sprinkle a tablespoon of cornmeal and then add the dough to the pan. Gently press the dough to the edges, and then cover it with plastic wrap and let it rest for about thirty minutes. While the bread is resting, I like to do the rest of my prep work for the focaccia which includes slicing the olives and infusing more olive oil with garlic. I do this by adding the olive oil to a small saucepan along with a couple of peeled garlic cloves and then heating it up just until the garlic becomes fragrant. Next, gently press the dough with your fingers to make little dimples all over and then barely press the olives into the dough. Brush it all over with the infused olive oil and sprinkle with Italian seasoning, freshly ground pepper, and freshly grated Parmesan cheese and you’re ready to pop it into the oven and sniff up that delicious aroma as it bakes! Enjoy, friends! In a round cake pan, brush 2 tablespoons of olive oil all over the bottom of the pan. Evenly sprinkle 1 tablespoon of cornmeal on top. Place the dough into the prepared pan and gently press to the edges to cover the bottom of the pan. Cover with plastic wrap and allow to rest for 30 minutes. In a small saucepan, heat the remaining olive oil and garlic cloves until the garlic becomes fragrant. Remove from heat. 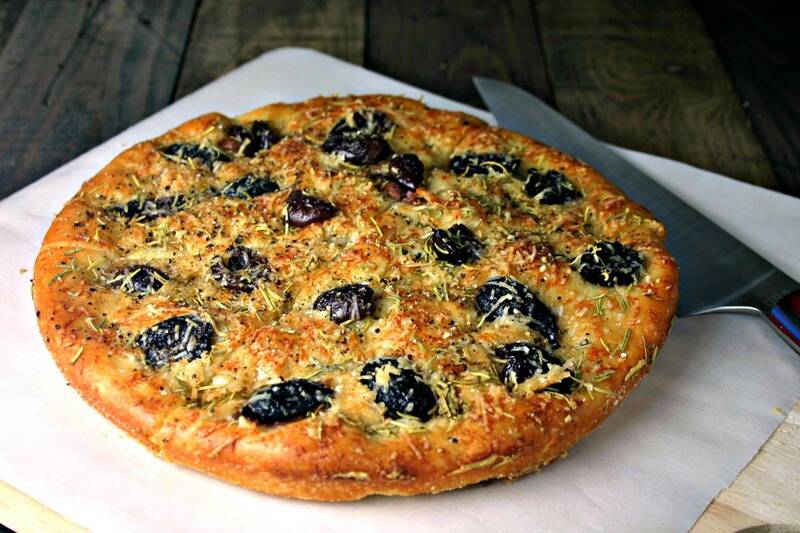 Gently dimple the dough with your fingers and then press the olives into the top of the dough. Sprinkle with the Italian seasoning, freshly ground black pepper, and the Parmesan cheese. Bake for 18-20 minutes or until golden brown. Slice and serve immediately. Serve with dipping oil, if desired.